Succulent street food, family favorites, mouthwatering regional dishes. This comprehensive new book from acclaimed chef, Saiphin Moore, looks at dishes from across Thailand in over 100 recipes. The recipes feature traditional and regional Thai dishes and a whole lot of modern variations as well. Saiphin Moore’s first book tells you how to cook Thai food in style, with delicious street-food recipes that are quick to make and go well with a modern lifestyle. Her enthusiasm is beautifully displayed in her collection of family-style dishes that appeals to all appetites and adventure levels. Each recipe is clearly explained and vividly photographed and is sure to motivate home cooks to get into the kitchen to whip up tasty Thai fare. 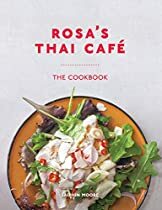 Divided into nine chapters (small bites, salads, soups, curries, stir-fries, grills and marinades, noodles and rice, sweet things, and basics) and in keeping with its contemporary twist on authentic Thai cuisine, Rosa’s Thai Café: The Cookbook celebrates traditional Thai cooking techniques and features dishes from her restaurant as well as family favorites from her frequent trips back home. Recipes range from the aromatic Beef Massaman Curry to the Soft Shell Crab Salad, Larb Spring Rolls, homemade Sriracha Sauce and Mangoes with Sticky Rice. From food truck owner to celebrated restaurateur, Saiphin clearly knows her way around Pad Thais and spiced curries. This beautiful cookbook is a must-have for the Thai food lover and an essential addition to the foodie bookshelf.